In the past 30 years, based on customer feedback, Mansions has evolved a strategy: of designing & building community-driven Apartment Blocks & Villa Projects; Independent/Customised Homes; as well as contracts-led commercial offices. Over the years, almost all of the residential properties of Mansions are located in Trivandrum. Our customer-interface experience reveals that at any given point in time, there are families aspiring for luxury apartments in Trivandrum, while there are homebuyers looking for 2,3 BHK flats in Trivandrum, and others who are generally wishing for apartments for sale in Trivandrum, but have not made up their minds on the exact space and cost specifications. While there are many flat builders in Trivandrum, Mansions’ Ongoing Projects, in a way, offers flats in Trivandrum which are based on the current economic scenario, individual needs and budget of specific target segments. For instance if a family is looking for 2BHK apartments in Trivandrum, and prefer to be in the company of people with similar interests; or are interested in 3BHK apartments in Thiruvananthapuram, the Mansions Palm Hills Apartments, Peroorkada offers a blend of community lifestyle options. Whenever one hears the term, apartments in Thiruvanathapuram or luxury apartments in Trivandrum, people start visualising a monstrous block of towers rising up into the sky with high density of residents in a relatively smaller space. However Mansions Palm Hills which offers apartments in Trivandrum comprises only five floors, thereby facilitating the delights of “Low Rise Living”. On the other hand, there is a select band of discerning families who scan for luxury apartments in Trivandrum, but desire to enjoy premium luxury with considerable privacy, but at the same time located in a majestic neighbourhood community. For such a privileged group, Mansions provides the elite opportunity to luxuriate life at Skyluxe Apartments, which has just one super premium apartment per floor. As the name suggests, owners of Skyluxe virtually own a hi-luxury bungalow in the sky. A 14-storey masterpiece, with apartments ranging from 1652 sq.ft. to 2750 sq.ft, there are just twelve ‘Skyluxes’ being crafted: nestled in the coveted, upscale, carbon-neutral environs of Golf Links, Kowdiar, Trivandrum( as of 1st December 2018, there are just 6 Skyluxes left). 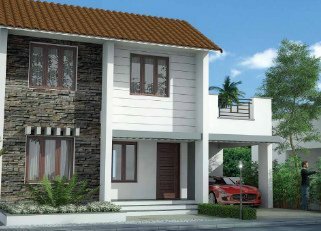 And for prospective homeowners who are not looking for new flats for sale in Trivandrum or new multi-storied apartments in Trivandrum, Mansions offers its novel flexi villa-plot project, Mansions Misty Meadows Villas, Thirumala, Trivandrum. The project offers villas which have flexi villa-plots that can be designed and built as independent customised homes; along with an overall common external design architecture, with the additional comfort of a secure gated community. Moreover, there is a provision for a customer to club flexible villa-plots if a larger home is required. The flexi villa- plots are available starting from an area of 1250 sq.ft. -- wherein you can move into your Mansions Misty Meadows Villa within 12 months of signing the agreement. Last, but not least, if you are neither exploring a flat for sale in Trivandrum nor villas, Mansions offers a home solution which is unique: an independent customized home on customer’s own land. So if you wish to design and build a customized home on your land, but are seeking a professional realtor to do the job for you at Trivandrum, get in touch with Mansions. Over the past three decades, Mansions has designed and built over 300 Customised Homes: each tailor-made to delight the families staying in them. So, you have a friend in Mansions if you want to delegate your customized home assignment to a professional, experienced, technocrat-driven firm who will ensure: state-of-art expertise; cost-effective & timely execution; stipulated statutory approvals; experienced & skilled craftsmen; apt materials selection and effective work supervision.